So, Thousand Arrows is on Kickstarter! Thousand Arrows is a tabletop role-playing game about samurai action and tragedy in the Japanese Warring States Period, powered by the Apocalypse. 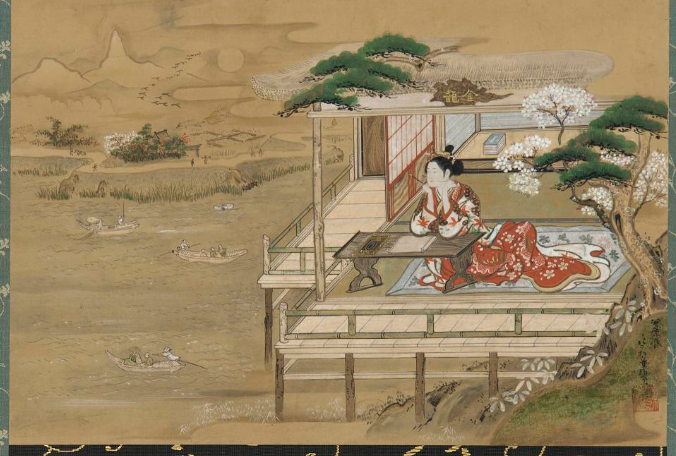 On the right, Lady Murasaki composes the Tale of Genji at Stony Mountain Temple, kneeling at a writing desk in a red robe and looking out over the veranda past some trees. On the left, boatmen cross a river, with fields and plant life in the background. I wrote Thousand Arrows because I wanted a role-playing game about Asian people and themes written in my native language, but not for the white gaze. When I see people who look like me in games, I generally assume I’m in for an Orientalist fantasy which falls somewhere (or everywhere) between yellow peril threats and exotification. More specifically, Thousand Arrows takes aim at common stereotypes and misconceptions about Asians which appear most commonly in gaming culture whenever a samurai or monk shows up. We’re emotionally repressed. We’re fixated on honor. We’re impractically polite. We’re obsessed with swords, or maybe kicking, depending. We’re low-tech. We’re high-tech. We’re prejudiced. We’re submissive. We’re taking over. We’re … okay, I don’t want to get into sexual stereotypes here, but there are a lot. I chose the Warring States Period setting because its historical details countermand many of these stereotypes and show samurai in a different light than the Edo Period-focused media which is more widely distributed in the West. To prepare for Thousand Arrows, I got a master’s degree in Eastern classics; studied Japanese martial arts for 12 years; and worked in gaming for four years, primarily writing, developing, and sensitivity-reading on Asian and African topics. If you want to meet cultural consultants for your own games—and not just for Asian things, not even just for race and religion things—please message me and I will hook you up. Nevertheless, we’re bringing in Japanese gamers as consultants on our core book. If we get to “Dragon King’s Gambit,” we’ll get Chinese, Mongolian, and Korean consultants as well, but that’s a long way off. War is hell. How do we create an ethical game about unethical wars? Thousand Arrows derives its themes and tone primarily from two sources, which guide how we answer that question. One is the Tale of the Heike, a Japanese historical narrative about the Genpei War of 1180 to 1185 CE, four hundred years before Thousand Arrows. While the Tale of the Heike recounts great heroes’ valorous deeds, it uses a Buddhist frame of reference to highlight how their gallantry aggravates a civil war’s inherent suffering and chivalry’s demise at ambition’s hands. The other source is Kurosawa Akira’s film canon, especially Seven Samurai, Throne of Blood, Kagemusha, and Ran. While Kurosawa’s films usually center the exploits of powerful samurai, they never shy away from showing the intentional or collateral damage samurai struggle does (especially to Japanese of lower station), carrying forward the Tale of the Heike’s tragic themes. When built into the game’s system, these themes and tone allow Thousand Arrows’s main characters to be interesting badasses who can strive after glory without glorifying war. One strength the Apocalypse Engine lends to this genre is the way that “moves snowball”: specifically, the dice mechanism and the moves’ structure cause the players’ actions to generate cascading troublesome consequences, evoking both Western and Japanese tragedy. Another that’s peculiar to Thousand Arrows is the attachment subsystem. Every character has several stats called “attachments,” which they can use to manipulate each other and push themselves to succeed and motivate people beyond their ordinary capabilities. Attachments include personal drives like ambition or faith and bonds to other important characters. When drawn upon, attachments tend to increase, growing more effective and influential; but when an attachment grows too high, it pushes a character into obsession, a destructive state of mind in which the character’s investment in the attachment causes dramatic suffering to themself and others. They can only escape this state of mind through experiencing a calamity of their own making, or dramatically betraying their attachment. I’m pretty sure the attachment system led to the scene on the game’s cover. One of the most difficult questions I’ve gotten was, “How does a designer in general (not just for Thousand Arrows) know when enough consulting has been done to minimize the risk of being labeled culturally insensitive?” To aid in the answer, I’ve created a framework called the Giant Robot of Offense, which I use to evaluate or describe how harmful a piece of media is. Check out that other article and read through the “Three Tiers” section—you don’t have to go through the examples right now. In my experience as a sensitivity reader and a grumpy person of color, if you don’t want to be labeled culturally insensitive, you must reach the “form arms and body” level. It needs to be clear that, even if your work depicts racism, you don’t condone, support, or glorify racism. The material needs to be clear of negative stereotypes. Historical accuracy figures prominently in this process, so you need to demonstrate that you’ve done lots of research. Hiring a sensitivity reader from the culture or cultures depicted (or, failing that, an expert in the subject) goes a long way. At this level, you yourself and your work won’t be labeled racist or culturally insensitive. But I would argue that, if you’re a game designer, that’s not enough. Even if your game reaches this level, when you release it into the wild, players may still use it to make something that hurts people. So you need to aim higher. Your work needs to promote good behavior and prevent bad behavior at the gaming table and in the real world. You need to form the head. We also encourage players to speak in casual modern idiom when they speak in-character, assuming the characters are translating the words and tone into equivalent sixteenth-century Japanese/classical Chinese/Aynu/Portuguese/whatever. We do so in order to counteract tendencies toward “Asian Voice” when role-playing. Even when no one is doing a stupid accent and everyone is trying, gamers tend to radically formalize their speech when they portray Asian characters: no contractions, lots of honorifics, long Latinate words, maybe even mystical sayings. I’m not sure I’d call this affect racist, strictly speaking; but it’s certainly a pattern which descends from and reinforces certain Asian stereotypes. I think dispensing with it diversifies players’ characterizations of Japanese people and encourages them to relax and set aside inhibitions and preconceptions. I need to sleep and go to Metatopia, but I want everyone to know I hear their concerns about the Imjin War scenario, and I’ll answer those next.